Yesterday we had lunch with my grandpa. Namine brought her piano books, so she could play a bunch of songs. 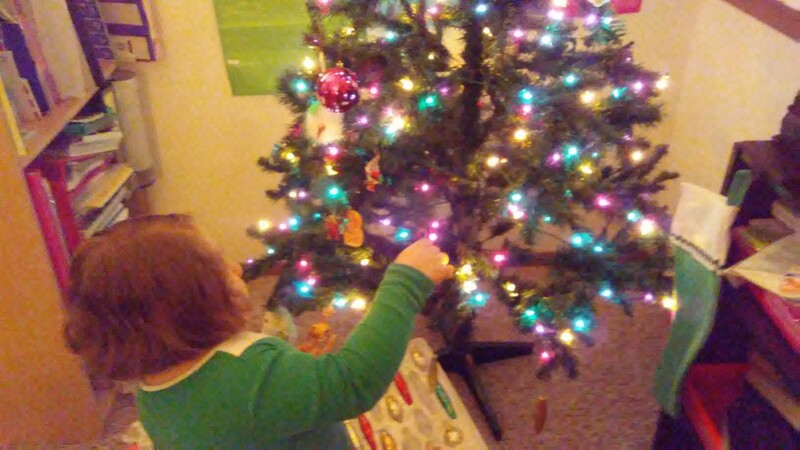 She has a Christmas recital coming up soon, so she’s been practicing a lot and talking about it even more. My grandpa has an electric piano, which is all very new to Namine. She loved being able to change the instrument, and played each song at least four times, so she could hear the difference. When we got home, I hauled in the Christmas boxes from the garage so we could start decorating. We wanted to have some snacks while we decorated, so Jessica made some barbeque meatballs, rumaki, pigs in blankets, and sliced fruit. While she made the food, I put up the tree. Once she was done in the kitchen, Jessica joined us in the living room. Since Namine had the bottom half of the tree covered, and I had the top half, she worked on our bulletin boards. The one we redecorate for the holidays she made into the manger scene. She and I fastened together a couple smaller corkboards for another scene, this one a living room, filled with snowmen, a tree, and other fun things. 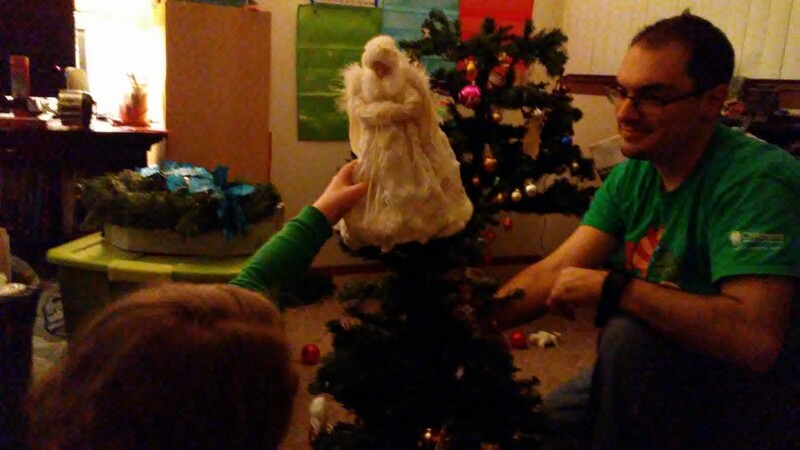 When the tree and our bulletin boards were done, it was time to put the angel up. I lifted Namine up onto my shoulders, but we couldn’t get close enough to the tree without Namine’s feet hitting it. So I proposed a solution: since the tree was segmented, I could disconnect the top and bring it down so Namine could put the angel on. She thought that was a great idea.